This is one of the other leather jacket that was featured on the Dior Homme AW06-07 campaign. Its is brandnew and i haven't even have a chance to wear but i've just sold it. I like the design but its not slim-fitting enough for me although i wear a size 46 for blazers. I guess i would have to size down when buying a leather jacket. Anyway, hope the new owner will like this more than me. where do you buy Dior items from previous collections? 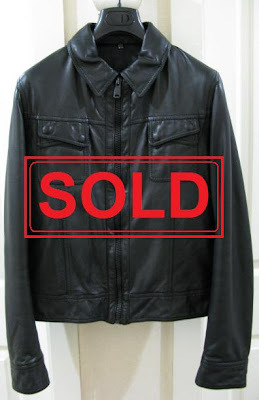 I usually get them on ebay and some times I have good finds (the campaign jacket for ss 2007, a campaign follow me jacket, and a great beck blazer from 05.) Most of the time though, there are only fakes or undesirable items. Is there a better place to get Dior items? I really want to get stuff from Reflection and Victim of the Crime. Oh and I'm done with school next week. I'll send you my collection pictures soon. well...i hunt for them...haha...Anyway, i seldom see good things on ebay, they are usually left over stuff from current collection. For much older collection, you may wanna try yahoo auctions in japan but beware of exorbitant prices. The selection seems definitely better, but it is hard to navigate (because of the language barrier- the translators aren't very good) and the sizes are super small. Most of it is in size 44. I guess I might as well keep an eye on ebay for interesting stuff that comes once every million years and wait for Hedi's return in 2009? question about dior fitting - recently bought the black 2 button in size 54 - the arms were too small for me in the 52 (which is my normal size in other designers) i want the short washed leather jacket a/w 07 - do you think i'll need that in 54 as well? I second yahoo japan auction. You are lucky if you wear a 48. Most japanese wear 44-46, so 48 tend to end on the lower price point for auctions! I do have some striped tees from votc if you are interested! Would you happen to have the ref of that jacket you sold? Hey Alex. I'm not really interested in stripe shirts, but I would be in any of the leather jackets or blazers from VOTC. I'm willing to pay top dollar for that kind of stuff. By the way, how do people feel about supertalk's market thread? they seem to have a lot of older Dior stuff there. i've bought from superfuture several times before and havent been burnt yet. as always just be cautious and do a little homework on your seller. You wouldn't by chance happen to have a fit pic of this stored on your computer? I am very interested in buying the same leather on Yahoo JP. Nice outfit. I love the leather jackets. Great gallery of some the wonderful leather jackets.